* What race teams use titanium for racing brakes? Home >> Brake Heat Shields >> What race teams use titanium for racing brakes? What race teams use titanium for racing brakes? Titanium is expensive, but also in high demand in racing applications, for a reason. In professional racing circles it is widely used as a principle component for managing brake heat. The light weight, structural integrity and minimal thermal conductivity of titanium alloy make it ideal for use at the highest levels of racing including the top stock car, and open wheel racing series such as NASCAR and Formula One racing. World class brake caliper manufacturers such as Brembo, already make use of Titanium inserts in many of their high-end brake caliper sets. And a growing collection of aftermarket caliper manufacturers include our brake heat shields in their big brake upgrade kits. Hard Brakes brings you the racing advantages enjoyed by top professional teams in an inexpensive and easy to install solution that requires no significant modifications to your car or budget. 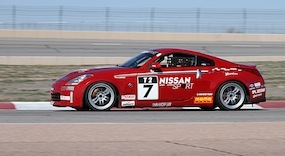 Our product is used by racers all around the globe in a huge range of racing series.